Laundry is such an everyday chore that we forget how wonderful it is to pull on clothing fresh from the 21st century technology of Speed Queen laundry machines. Water of the correct temperature pours into a tub at the twirl of a knob, and air of the correct temperature tumbles our clothing dry with the push of a button. 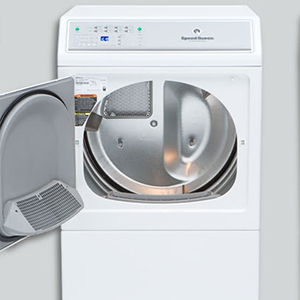 High-powered, quality engineering has created Speed Queen washers & dryers for our homes so that we can forget the era when an entire day had to be devoted to “washday” and sheets froze dry in the Edmonton winter. Taming laundry has been a 100-year mission for the Ripon, Wisconsin, company better known for its commercial line of Speed Queen washers & dryers. Fortunately, its home line is as tough and durable as you would expect from a company known for steel machines that stand up to the hard work of commercial vending laundries and industrial-strength washing and drying in hospitals and hotels. 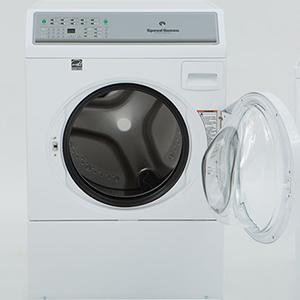 Whether you are replacing worn-out machines or building a new space in Edmonton, you'll want to check out Speed Queen laundry machines that are designed to care for your favorite pieces no matter how delicate or grime-encrusted – and that takes special know-how that can be acquired only with experience. You can purchase the “Made with North American Pride” Speed Queen washers & dryers in Edmonton for years of carefree laundry days (or evenings, or minutes) – negligible amounts of time that allow you to go about the business of living.